We have been providing legal consultancy services for many years to multi-national corporations, individual investors, and non-profit organizations seeking to establish a presence in Iraq. Dr. Bassem Abdul Zaman: "We seek to open wider horizons with foreign companies to create new jobs"
During the meeting, they discussed obstacles foreign companies face working in the oil industry to implement provisions of the Labor Law and how to overcome these obstacles, especially with regard to the employment of 50% of national labor in those companies, as stated in the Council of Ministers' Resolution No. 80 of 2013. “DSLM Legal Services helped us to resolve a complex and previously unsolvable legal matter with the Iraqi Ministry of Oil. DSLM has a culture of problem solving. Its General Counsel, Sermid Al-Sarraf, showed relentless effort and professionalism when acting on our behalf and demonstrated high-level knowledge of Iraq, its government and its legal system. In a region challenged by corruption, DSLM has a proven track record of operating with integrity and supporting clients to do the same. "Since November 2009 we have had the pleasure of working with DSLM in Iraq across a broad cross-section of litigation, commercial, compliance and regulatory matters, including most notably, a longstanding and significant debt recovery matter in which DSLM's experience, patience and technical expertise combined to achieve a very positive outcome for GLOBAL. I have found DSLM's General Counsel, Sermid Al Sarraf to be an extremely tenacious and proficient attorney who has always displayed the utmost professionalism in all work undertaken for our Company. I have no hesitation in recommending DSLM to any company or individual seeking the provision of legal or other business support services in Iraq." Welcome to Dar Salam Legal Consultancy and Translation Services, LLC (DSLM). We are a professional Iraqi legal consultancy firm with offices in the upscale Arasat district of Baghdad and an affiliated office in Los Angeles, California. © 2018 DSLM. All Rights Reserved. The headlines from Baghdad may be filled with violence and mayhem, but Sermid Al-Sarraf sees a different Iraq beginning to bloom: a land where Americans and Iraqis are working together to restore independent courts, reform the penal code, and train judges and lawyers in human rights and international law. Al-Sarraf, a Southern Californian and son of Iraqi immigrants, currently on leave from his job as an attorney for the city of Los Angeles, is part of an ambitious venture that pairs U.S. and Iraqi universities to reform and modernize legal education. Working with DePaul University College of Law’s International Human Rights Law Institute in Chicago, Al-Sarraf and his partners say their work represents a glimmer of hopeful change that has largely been shrouded by the relentless spate of bad news from Iraq. “No matter what people think about how we got into the war, we have a legal and moral obligation to leave a society that is secure and stable,” he said in a recent interview during a brief return home from Iraq this month. “It’s a long journey for Iraq to build civic institutions that can protect people, but we’ve made significant inroads,” he said. One success came when the U.S.-led Coalition Provisional Authority agreed to reverse a policy instituted by Saddam Hussein and separate the courts from the executive branch. The move, which was decreed last year and began to take effect this year, restored judicial independence in Iraq for the first time in more than two decades. U.S. officials at first had been concerned that changing Iraq’s government structure unilaterally would violate the Geneva Convention, Al-Sarraf said. He successfully argued that it was Hussein who had violated international law by eliminating the independent judiciary in the first place. When his argument prevailed, Al-Sarraf said, he sent off an exuberant e-mail to his four children back home in Sunland. “This is an example of how one voice can make a difference,” he wrote. That upbeat message is echoed by Majid Alanbaki, an Iraqi University law professor who works with Al-Sarraf. “The progress has been excellent,” Alanbaki said in a telephone interview from Baghdad. Still, pitching democracy, legal reform and human rights in Iraq is not always an easy sell. Some Iraqis have pointedly questioned whether Americans practice what they preach. “It’s a challenge, because this administration has been so cynical about international law,” Guinn said. In addition, some Iraqis are leery that the largely secular legal reforms pushed by Al-Sarraf and his colleagues will squeeze out reliance on Koranic law, according to Alanbaki. Other Muslims, who largely opposed the war, are ambivalent about their Islamic brethren who assist U.S. efforts in Iraq. Despite such concerns, Al-Sarraf, 40, sees the chance to aid the liberation of his ancestral land as the fulfillment of a lifelong quest. In the 1980s, he started a newsletter to publicize Hussein’s atrocities. 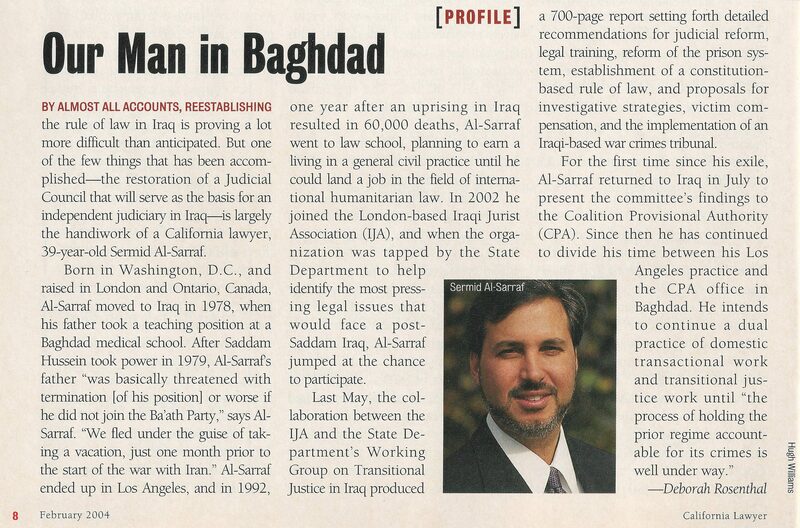 In the 1990s, after attending UCLA and UC Berkeley, he went to Whittier Law School to equip himself with skills to advocate the overthrow of the regime in Iraq. 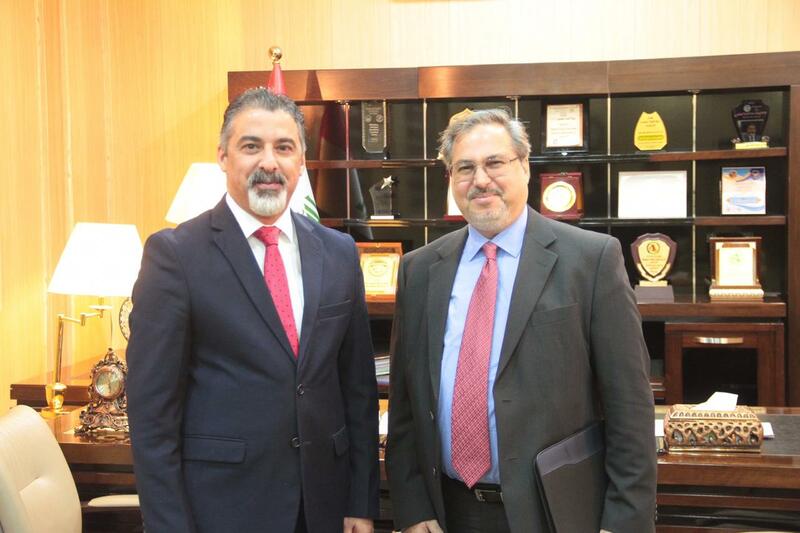 Now, with fluent Arabic and family connections — his uncle is Iraq’s equivalent of the chief justice of the Supreme Court — Al-Sarraf aims to meld Islamic values and U.S. democratic traditions to help lay the legal foundation for a new Iraq. A soft-spoken man with a closely shaved beard, Al-Sarraf says his passion is shaped by his family’s history. His father, a physician, left Iraq to study at Johns Hopkins University in Baltimore in 1962 and stayed in the West to escape the national tumult after the Baath Party took control of Iraq a year later. A cousin was executed by the Hussein regime for alleged affiliations with a banned opposition group; other relatives were killed in war. His uncles were professionally sidelined for refusing to join the Baath Party, he said.